er to gain velocity toward home plate when pitching. 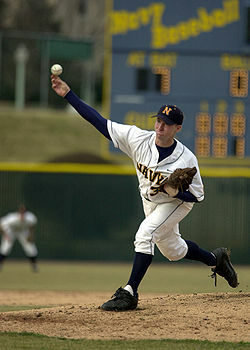 In addition, a higher mound generally favors the pitcher. With the height advantage, the pitcher gains more leverage and can put more downward velocity on the ball, making it more difficult for the batter to strike the ball squarely with the bat. The lowering of the mound in 1969 was intended to "increase the batting" once again, as pitching had become increasingly dominant, reaching its peak the prior year; 1968 is known among baseball historians as "The Year of the Pitcher". This restrictive rule apparently did its job, contributing to the hitting surge of modern baseball. A pitcher's mound is difficult for groundskeepers to maintain. Usually before every game it is watered down to keep the dust from spreading. On youth and amateur baseball fields, the mound may be much different from the rulebook definition due to erosion and repair attempts. Even in the major leagues, each mound gains its own character, as pitchers are allowed to kick away pieces of dirt in their way, thereby sculpting the mound a bit to their preference. The pitcher may keep a rosin bag on the rear of the mound to dry off his hands. Major league baseball teams are also permitted cleat cleaners on the back of the mound. This may be a flat grate-style plate, or simply a hand tool such as a piece of wood used to remove mud and dirt from cleats. These items are allowed to remain on the backside of the mound at the discretion of the umpire, thus reducing the probability that they will affect a live play.